In the US, a Department of Motor Vehicle (DMV) is a state-level government agency that manages vehicle registration and driver’s license. There are various similar departments that exist but many do not use DMV nor are the traditional functions handled by them. 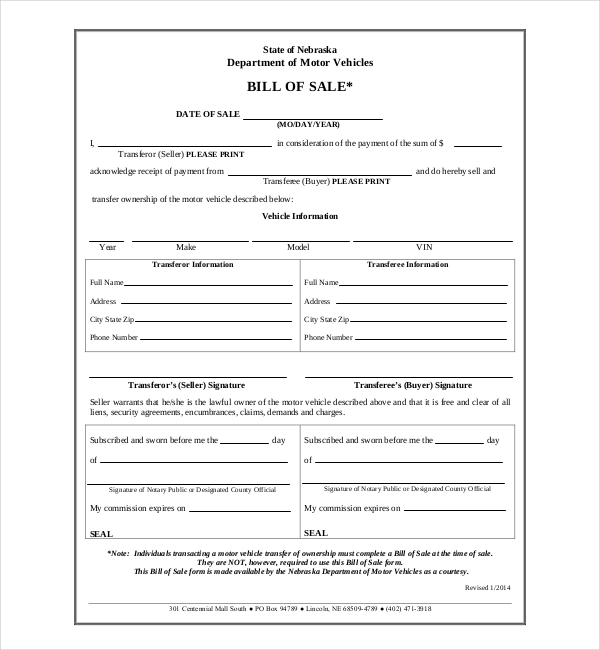 The Bill of Sale Forms are such forms that come from a particular agency which is state approved. The buyers and sellers are involved, including the agency that keeps a part of this form for their records. 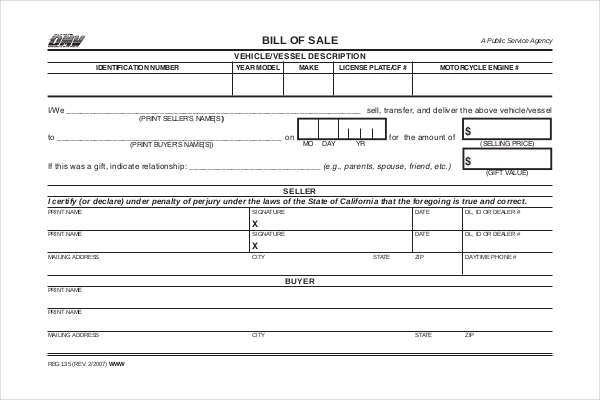 People who want to buy or sell vehicles under the California Department of Motor Vehicle can use this bill of sale form. The requirements in the forms are in context to the vehicle in question. The buyer, seller, description of vehicle and price is needed to be mentioned here. A part of this form is for the record of the agency. New York is probably the busiest city in America. Vehicles are used in huge majority here. 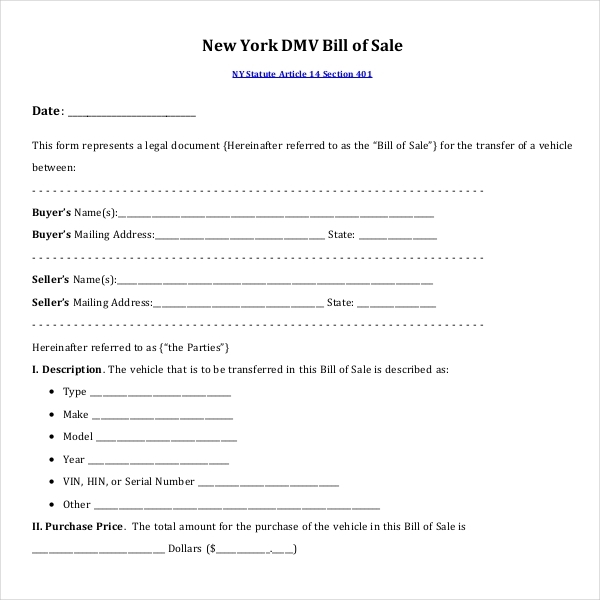 Those who are keen on transferring the ownership of vehicles via New York Depart of Motor Vehicle can apply for this Bill of sale form. This form follows Section 401 of Article 14 of New York Statute. All the registration work is done here for vehicles in question. 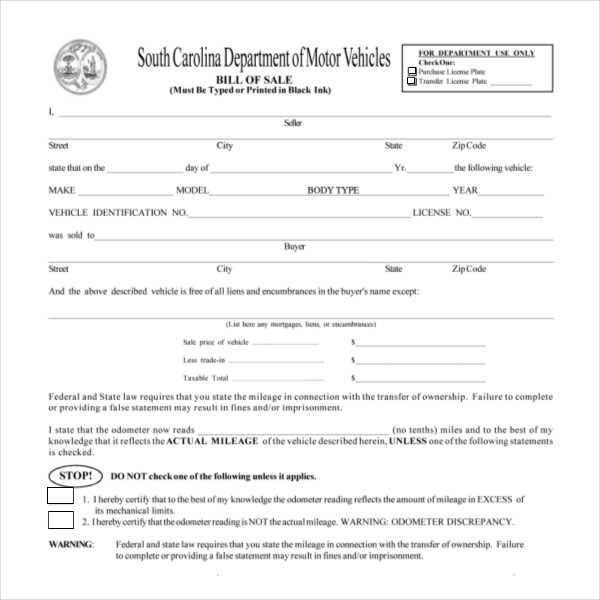 The Department of Motor Vehicle in South Carolina ensures that the licensing and registration of vehicles are done here. 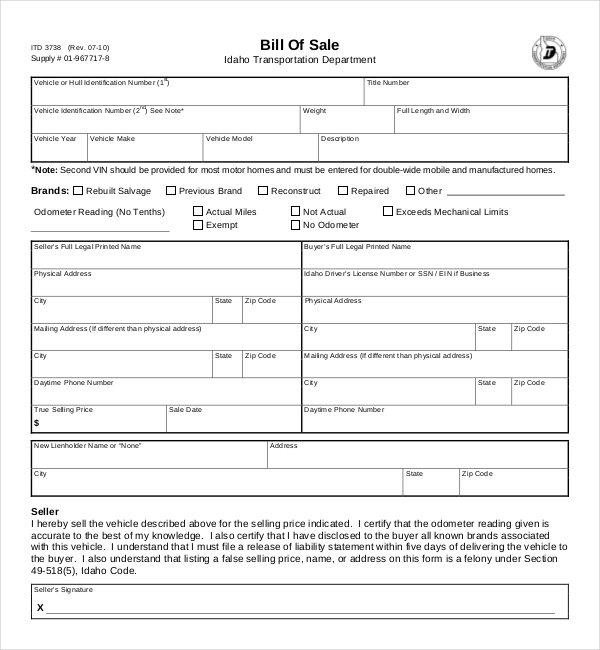 The Bill of sale forms have all the details regarding the transfer of ownership of vehicles. Accordingly, after verification and checking original documents, the registration work is done. Any misleading information leads to legal problems. Persons interested in registering and transferring the ownership of vehicles in Alaska, like cars and even snowmobile may use this form for registration and license purposes. The Alaska Division of Motor Vehicles is involved in snowboard registration and works relating to the license of drivers. It has stated all the requirements dealers, termination of ownership, renewal information that must be read carefully before filling the form. 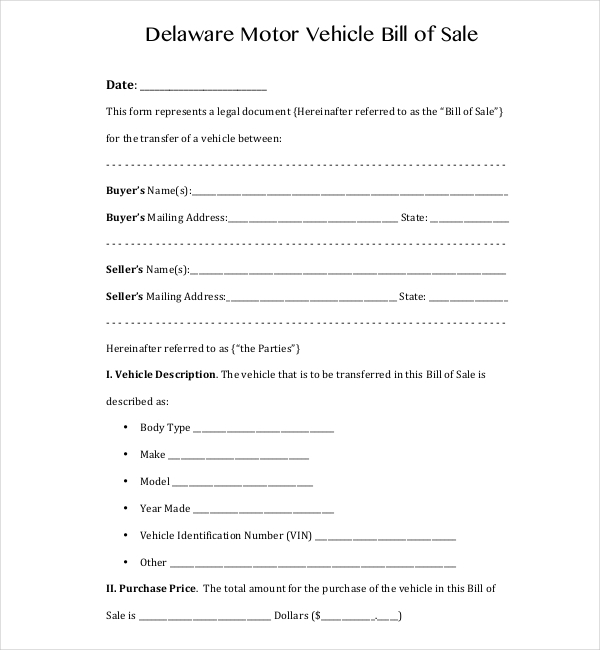 The Delaware Division of Motor Vehicle needs all the information about the ownership of vehicles, buyers and sellers information and description of vehicle so that the registration and license work start immediately. The record of the ownership with registration and other details are intact in this form. To get the ownership of vehicles in Florida, one needs to fill the Bill of sale form under the Department of Highway Safety and Motor Vehicle in Florida. This is a long form that needs details about the buyer, seller, vehicle etc. The forms are to be filled in carefully before submission. All the required original documents must be shown as well. To own a motor vehicle under the Georgia Department of Driver Services and Motor Vehicle Division, this bill of sale will be important for the buyer. All the details including price and odometer read must be mentioned truthfully in the form. For verification and record purposes, original documents are shown to continue with the procedure. The Michigan department of state has a bill of sale form that helps in transferring of ownership or transaction of vehicles. This paperwork under the Michigan state needs all data about the customer and vendor plus the every detail about the vehicle. This form can be used for non-titled trailers, Non-titled watercrafts and snowmobile. The Department of Motor Vehicle of Oregon is a state agency that handles the transaction of vehicles between the purchaser and the seller. 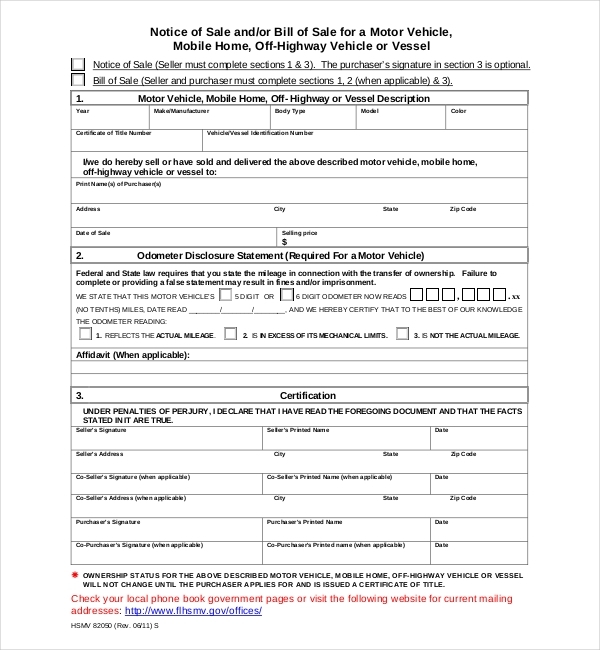 The department of transportation driver and motor vehicle service releases a form that requires transfer details of the vehicle, buyer and sellers. A late transfer of title from the buyer’s side may involve extra fee for later title transfer. 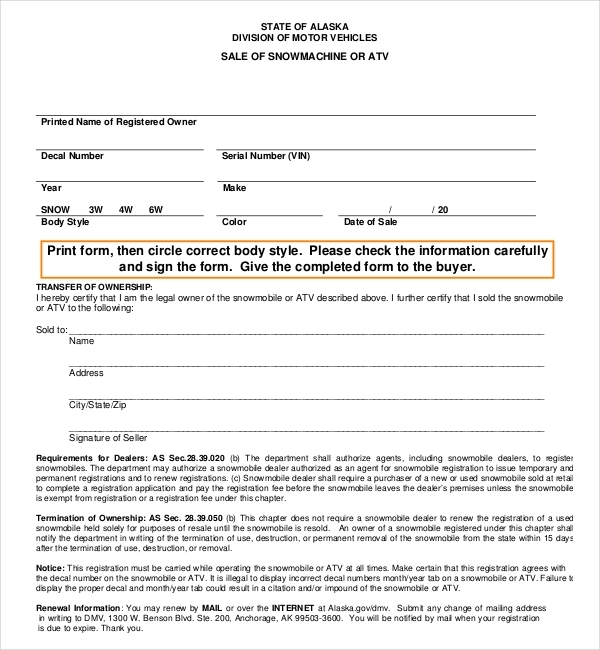 The Nevada agency of Depart of Motor Vehicle has a bill of sale form for the transaction and ownership of certain vehicles. 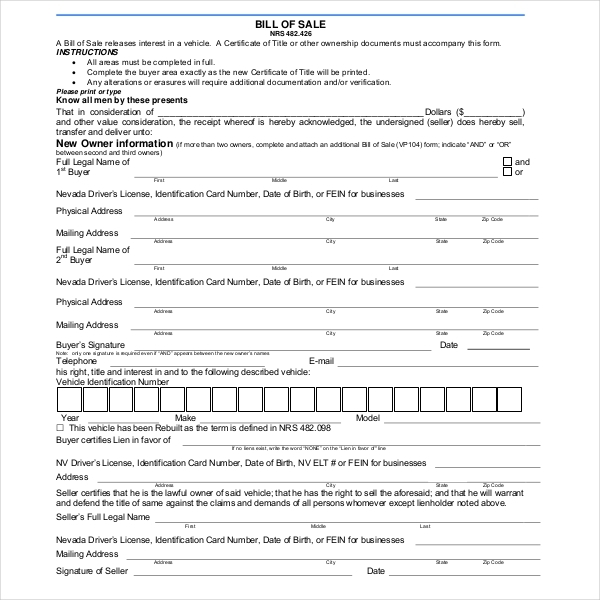 For certification of title and other purpose, this Bill of sale form is required. Transaction of vehicles and related functions can be done through Idaho Transportation Department. The ownership process requires sellers, purchaser, and vehicle details which includes model number, odometer reading, original purchase rate, odometer read, color, serial number etc. 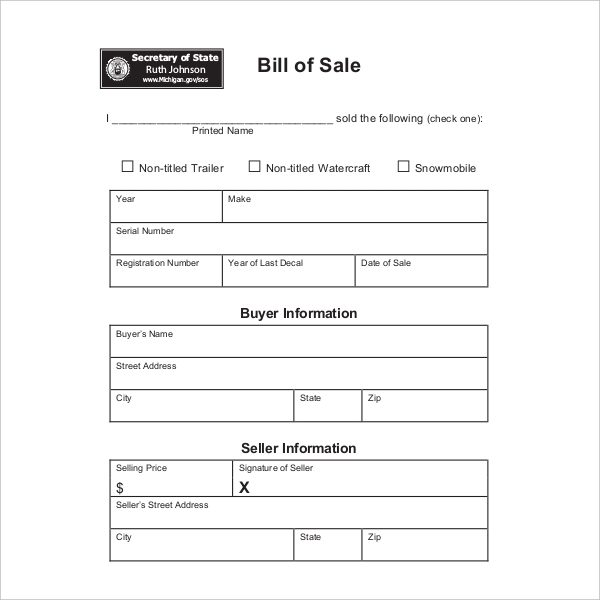 The bill of sale form under the Nebraska Official Department of Motor Vehicles needs details about the customer and seller for transaction purposes. The vehicle details and original documents must be present for verification. This form is important for those who need registration and ownership of vehicle under Nebraska State. 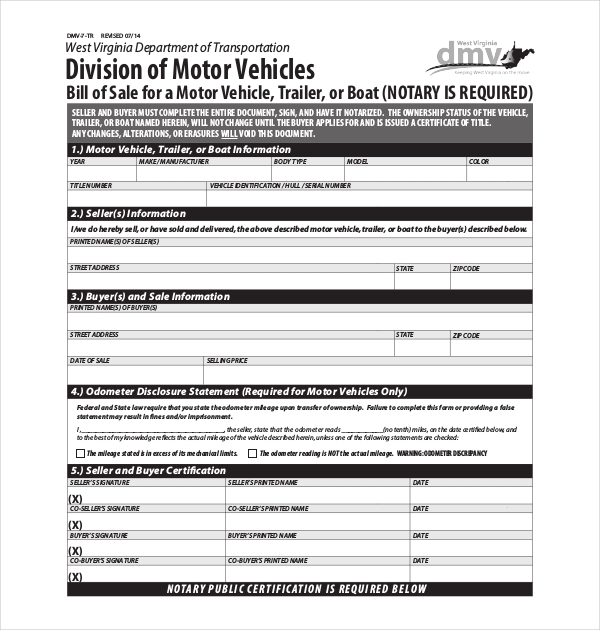 The West Virginia Division of Motor Vehicle has a bill of sale form that helps people who want to get a transfer of ownership for trailers, boats and vehicles. This form is for a proof of transaction purposes and needs information relating to the transaction. This is a basic form for people who need new vehicle in their name. 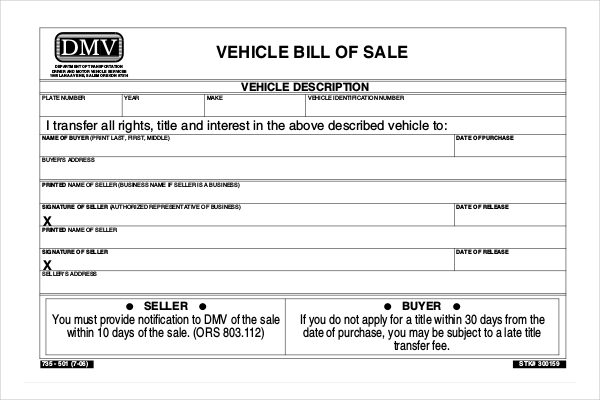 The vehicle information along with the seller’s and customer’s name must be present in the form. Purchase price, trade-in price, signature of both parties and if possible a notary should be present. 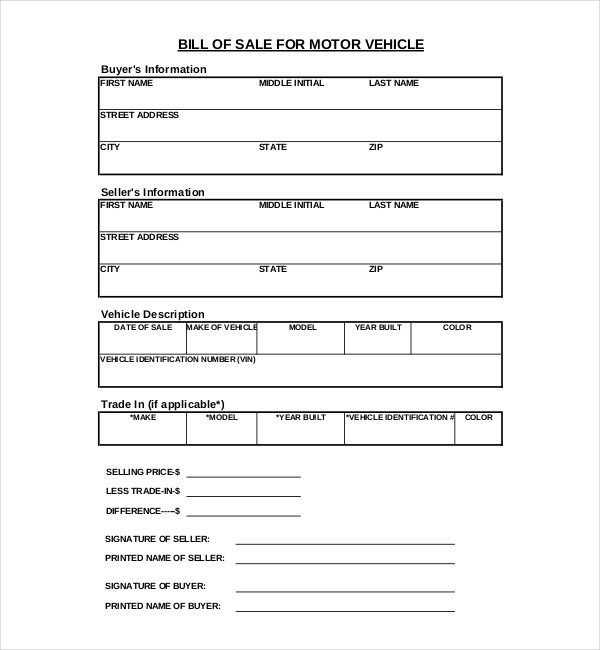 Bill of sale forms under Division of Motor Vehicle Denver needs to be filled up for any transaction of vehicle between the seller and purchasers. This information is recorded under the Denver DMV for legal purposes and references in future. Denver, capital of Colorado, has such forms as it is a legal procedure under the transportation act. Bill of Sale forms under state government agency helps in keeping all the records of the transaction of the vehicle intact as per the laws of US. 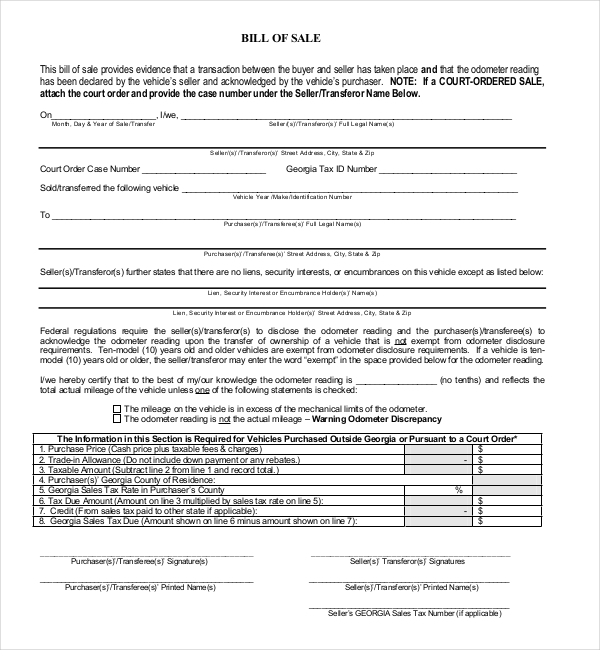 The bill of sale form has the capability to be shown in the court of law in case any problems occur regarding the vehicles. This is the major reason why these forms are used. The transfer of ownership of transport and registration plus driving license approval is done by Department of Motor Vehicles of respective states. It is a legal process and one should undergo this one so as to avoid legal problems. While filling up such forms make sure all the original documents are handy for verification. Any omission of documents or invalid papers will lead to a stop in the registration and ownership process. The agency is liable to fill a case if false information about the vehicle or any other things is provided. The insurance papers should be there for the vehicle. Insurance paper helps in refunding the damage cost of the vehicle. Vital information that almost all the DMV Bill of sale forms require is the odometer reading. Tampering with the odometer reading will create problems in future. Notary details are required in some almost every DMV Bill of sale forms. A notary helps in legal process of the vehicle in question. The person acts as a witness as well. Ensure that you read the form carefully and read it. Check the form after you have filled it as every detail must be important. This works as the evidence of transaction hence all the information must be correct. A person can make a copy of this form (after filling it) so that he/she remains in in a safe side in case something goes wrong. There was a time when one had to manually buy forms for the purpose of vehicle ownership. That is not the case anymore. These forms are just one click away to make your life a lot easier. You can find these forms in both Word and PDF formats. Since this is a state government agency form, many might think about the authenticity of the forms, but you should not worry about it as these forms are error-free and easily downloadable. You can print them too. We have the forms in all versions, that is, higher and lower ones, thus it should not be a problem for you. In case you need extra customization, we will be happy to help you as you require. Be assured about these forms that are available in our website. 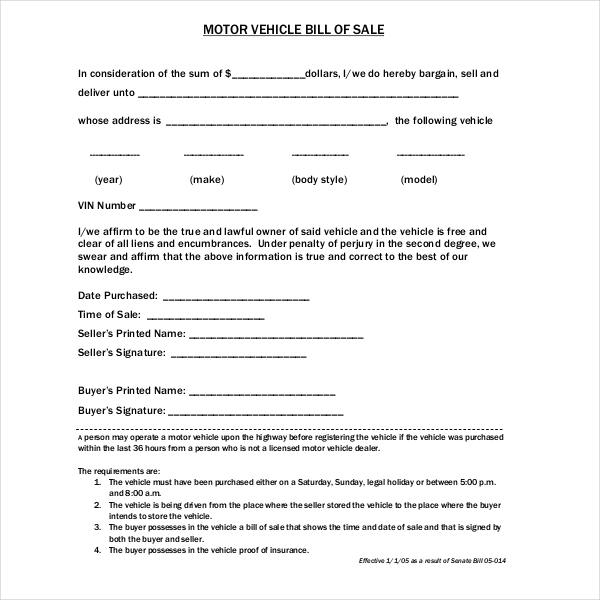 Department of Motor Vehicle Bill of sale forms is very important for anyone who wants to buy a vehicle. It acts as a proof paper that they had purchased a boat/car for their personal or professional purposes. The agency keeps these records for references and other matters. All the forms must be signed with date by all the parties as a mark of transaction confirmation.